I decided to do a list. 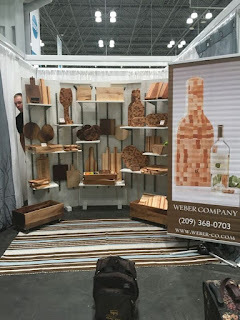 10 things I learned at the NY Now Show this year. 1.Setting up my booth with Mr. Know-it-All was interesting.....He's a creeper. 2. Retail is changing the way companies look at merchandise and selling. Amazon is King and I am in the back seat. 3. Sales people across the US are questioning if shows are the way to go in order to get your product to buyers. 4. Mr. Know-it-All thinks he knows it all. 6. I met some really nice business men from Japan who bought some of my boards. I got to put a pin on my world map in Osaka Japan. 7. I got to meet with the former president of Williams-Sonoma for dinner. We are friends now and he got to meet Mr. Know-it-All, but I don't know if he knows I call him that. 10. By Wednesday night I was so tired from the show and going out all night I could hardly keep my eyes open. This show was an eye opener for me in that it did not produce the results I received in 2013. Are the buyers that came before not going to the shows? Are the buyers going online now? They are closing more retail stores throughout the US so maybe. I have a lot to think about. But I do know one thing.